Last year’s jQuery conf was sponsored by BlackBerry and they gave away playbooks, loads of ‘em. This gave us an idea. Why not a game that ran across many of them? So we made a game that you can host and have multiple players join with their own device. You can also attach multiple screen together using hot areas so you can play across browsers across multiple computers. We called this game Twon… cause it’s kinda like Tron… kinda. Naturally, the tech of choice was Node.js based sockets using Express. This allows some easy subscriptions to events across multiple devices. Setting up the game is real easy. You can download the source at https://github.com/skinofstars/Twon, run npm install and then fire node app.js at it and you’ve got the Twon server up and running. Then, just visit the host machine with a few other browsers. You’ll see in the /public folder of the repo which pages to visit depending on what you’d like the browser to act as. We find projectors are great as arenas and mobiles as controllers. Trying to disseminate information from the news about what's going on at the Fukushima plant in Japan in the aftermath of their recent earthquake and subsequent tsunami is a tricky business. BBC is all about pictures of explosions and worried looking people in paper masks. Sometimes it's interesting to have a little more detail about what trouble they may be having in managing a nuclear fission plant in a critical state. Well as it turns out, I know a nuclear engineer who was kind enough to give me a summary. Voila. Simple once you know. I had a bit of a moment earlier in getting PyDev up and running in Eclipse. Installing is easy enough through Marketplace in Helios, but when I went to open a project I was denied! Anyway, figured it out, just needed to select my interpreter. On Saturday 20th Nov I spent the best part of the day at Barcamp Non-Profits (NFP) at the Oxford University Club. 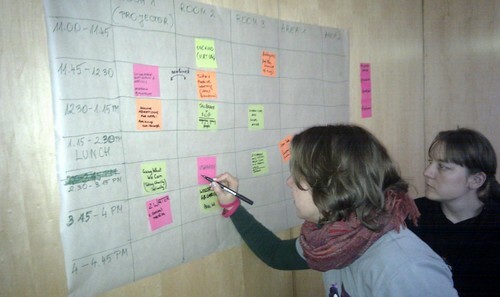 This was my first Barcamp, so I was interested to see how the event and it’s organisation was to unfold. For the uninitiated a Barcamp, often called an unconference, is as the name would suggest an ad hoc organised conference. A timetable of slots is offered and people simply add their name to a box in order to host a talk. This was a two part talk with the focus being on monitoring information within social media. This could take the form of following discussion on a topic relevant to a charity’s engagement, or could equally be applied to monitoring a brand activity. I noted two tools in the first half which I thought could be of use. The first was Social Mention, which is best used for tracking social sentiment on the various social networks (Twitter, et al). The second was Board Tracker, which can be used for checking various forums for keyword mentions. There was also discussion of using the advanced mode of Google search. The second half was a brief discussion of a theoretical Twitter filter that would allow someone to summarise the important points of conversation using an quasi-AI approach. The interested parties of which broke of into a group to discuss the implementation of the project. This was a talk given by my boss Dave Fletcher. I was involved in the projects inception at the Jailbrake weekend hosted by Social Innovation Camp, so I was very interested to see how the project had progressed. I was pleased to hear that even after talks with various authorities and forthcoming pilot runs, the project had retained its original good ideas; to get friends to help you identify your key skills in a structured and playful format which will hopefully aid you in gaining employment. This is such a promising project and I feel really proud for even the small part that I played in its creation. Well this talk absolutely blew me away. It was one of those ones that starts interesting and makes you chuckle and finishes with you feeling shocked at what you’ve learnt. The presenter, Toby Ord, has actually appeared in various mainstream media publications discussing his project, but as he readily pointed out, it isn’t a message designed for the 140char social conversation. I think it would be difficult for me to do him justice. This is a man who has such belief in the difference he can make to so many peoples lives that he is pledging to donate a significant portion of his income for the rest of his life. His argument is convincing and I sincerely hope you will visit his site, givingwhatwecan.org and take the time to read what he has to say. The last talk I went to was actually more for fun than engagement, but considering my rock background I really can’t be blamed :) This was Ben Walker of Twitter song fame discussing his life as a niche geek semi-celebrity. Fun and quirky. All in all, I had really fun and interesting time. I will certainly be going to another Barcamp at my next chance. Barcamp Non-Profits will be coming back, perhaps in spring and probably in London next time. You can find out more by going to barcampnonprofits.com or by following them on Twitter @barcampnfp. If you get the chance make sure you go. Open eclipse and let it rebuild its indexes. Job done. I’ve had many jobs. My full CV is unprintable in a comfortable digest. Though all were useful in their own way, it was still a means to an end. Rock superstardom… so four years ago I decided to retool in what was then a time devouring hobby. So far, things have been going pretty well. I got a decent degree and have had two awesome jobs in a row, the second of which I still happily work at (whiteoctober). I’ve been keeping my head down for some time now. I’ve really been wanting to get good at what I’m doing before I start to think of other things. But I’m happy to say that recently I’m starting to ‘get it’ with many of the techs that I’m using. I know I still have sooo much to learn, but it’s a good feeling to be making progress. Hmm, what else is new… I move in a couple of weeks, to a place in Headington. At the moment there are five of us living in a four bedroom house in East Oxford. It’s fun and communal and all, but I’m really looking forward to moving in with just myself and Emily. You should check her blog by the way: emilychiang.wordpress.com. Actually, I think that’s it for now. Take care.